Having a saddle that fits your horse is by far one of the most important things to keep in mind when riding. If you do not have a correct-fitting saddle it could lead to all sorts of problems – some worse than others. Many people have tried various tests to get an idea, and ten to one you have probably tried a few: The baby powder test, sweat mark interpretations etc. 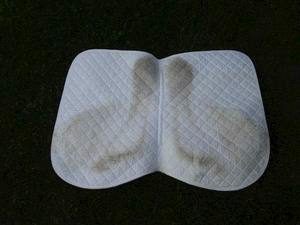 but in actual fact, do you really have any idea what the sweat and dirt marks under your saddle really mean? We hope to clear some of the mystery up for you. Before anything else – it is important that you make sure your numnah stays evenly beneath your saddle before you get on and stays that way throughout your ride. Once you are done, you should realise, once you have untacked, that the dirt and sweat marks are fairly symmetrical on either side. The amount of dirt accumulated is a lot less important than how even the marks are on your numnah. The gullet (the channel that runs down the centre of the underside of the saddle) or centre of the pad should remain clean—in no circumstances should this be touching your horse’s spinal area. The parts of the pad in constant contact with the horse will appear darker. If the darker marks are near the front-end of the saddle it is likely that the saddle is too wide and tilting forward, causing rubbing. If the marks are near the back-end of the saddle – it could mean that you are sitting too far back. If the darker marks are near the front left and back right of the pad it could indicate that the saddle is swinging to the left at the back. Excessive marks along the gullet horizontally on the left will indicate that the saddle is leaning to the right. Another observation could be that there was little to no dirt where the saddle should be in contact and that could either mean that your horse simply didn’t sweat there or that the saddle is most likely too narrow so that the panel has little to no contact with your horse’s back. In a nutshell: Dirt equals movement. A few other things worth checking are your stirrup leathers and possibly getting someone else to ride to see whether they produce a similar pattern. We need to remember that we often demand a lot from our horses and it is only fair that we make them feel as comfortable as possible, as well as make it an enjoyable ride for yourself.